Big projects are destablising in the short term and have minimal impact in the long term, says economist. Economist Rolf Gerritsen, research director at the Alice Springs campus of Charles Darwin University, is talking about the $20 billion INPEX gas project and its impact on the Territory economy. 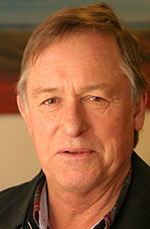 The Alice Springs News Online asked him whether it is the “game changer” from which “all Territorians” will “ultimately benefit” as Chief Minister Paul Henderson (pictured) would have us believe. Mr Henderson told the audience of ABC TV’s Q&A in October that “this amazing investment” is going to “underpin our economy for the next 40 to 50 years”. This week Mr Henderson announced another “major milestone” in the project’s progress: a signing ceremony of the Sales Purchase Agreement for the gas, which he saw as “a vote of confidence in the Territory’s future in the resource sector”. The announcement came on the heels of the Treasurer Delia Lawrie’s Mid Year Report which touted the “resilience” of the Territory economy that sees us “well positioned to take advantage of the major projects on our horizon”. Major projects will test that resilience, says Prof Gerritsen. Why is wages money no object for these big projects? It’s because they’re using borrowed capital, which seems counter-intuitive, but the point is to do what it takes to get as quickly as possible to the production phase. “Up till now for all the preliminary works INPEX would be using their own money, their equity capital. But when they start building they’ll be going to the banks saying we want to borrow $x billion. No company wants to risk that amount alone, so they borrow. There’ll be a lead bank and a syndicate of banks, probably around 12. They’ll all contribute some of that money to spread the risk. But there’ll be very tight conditions on repayment because there’s no sovereign risk in Australia [ie, no risk that government action would cause an unforeseeable loss without legal remedy]. But won’t there be a lot of money burning a lot of holes in Darwin pockets? Not as much as you’d think. Prof Gerritsen expects that a lot of INPEX jobs will go to ‘457’ workers from countries like the Philippines and to fly-in, fly-out workers from around Australia, all of whom will be taking most of their money home with them. Furthermore, when the construction phase finishes the big construction companies involved will “pinch the best labour”. And big projects don’t do that kind of community building any longer, says Prof Gerritsen. So, once the Darwin economy stabilises, what then? The Chief Minister on Q&A cited royalties as the source of benefit “for all Territorians”, saying it would be the responsibility of government to disperse those payments “through the community in terms of better education, better housing, better health”. Prof Gerritsen says there won’t be “huge amounts from royalties”. Some benefit may arise if INPEX does a deal like ConacoPhillips did, funding the West Arnhem Land Fire Abatement project to offset their carbon emissions.This at least Prof Gerritsen describes as “a great project”. He expects that INPEX will also sponsor a lot of things, as a good corporate citizen, “but that’s $5000 here, and $15,000 there”. So, after this reality check, what about NT Treasurer Delia Lawrie’s upbeat assessment of the economic outlook for the Territory? She claims the government’s historically high infrastructure spending – up from $885 million in 2008-09 to $1.7 billion in 2010-11 and an estimated $1.5 billion in 2011-12 – supported Territory jobs through the Global Financial Crisis and “positioned us for future growth”. But Prof Gerritsen says the Territory’s level of debt, which is “going up quite dramatically”, is a concern. “If I were Terry Mills I’d run dead in the next election, it’ll be a great one to lose. But politicians always think they can solve problems. They can’t because there’s a structural problem with our budget and we’ve made it worse. “When the economy was going well from about 2004 to 2007 or 2008, they should have been running big surpluses and retiring their debt. But they weren’t, they were running small budgets actually at deficit because they were allowing debt to accumulate and spending money on being popular. Ms Lawrie’s Mid Year Report has GST revenue for the NT revised down by “some $60 million”, bringing the cumulative drop since the start of the Global Financial Crisis to $670 million. Says Prof Gerritsen: “The Treasurer can talk about being Keynesian, spending more money and running a deficit, even a cash deficit, but in actual fact they’ve been running deficits for the last eight years so they really don’t have much room to move. While making no apology for their recent record infrastructure spending, the government is implementing a “gradual pullback”, says Ms Lawrie (pictured), ahead of the major projects starting next year. But they “are not going to solve the Treasurer’s fiscal problems”, says Prof Gerritsen. Is there a step by step strategy that would? Yes, he says – but it would involve pulling in Darwin’s and Palmerston’s belts. “We’ve got to stop hiring public servants. We should have about 12,000 public servants in the Territory, but we’ve got about 18,000 – 3000 of them added since Labor came in. “We need to reduce what I consider to be wasteful expenditure. Big cuts in the budget for recreation, for instance. There are things that people in Darwin expect, they want to see AFL games, each football code wants its own stadium and oval, it’s mad, you can’t afford that. “But if a change were proposed, the electorates are small, you may only need 50 people to vote differently to knock off a sitting member. I don’t see how that will change. “I see more Commonwealth intervention. Personally I think that’s a good thing because our prioities seem to be boat ramps and water gardens and there’s a strong urban bias. But what about wealth creation, stimulating a more productive economy? “Spending on basic infrastructure is what we need, on roads in the regions. Not on the sort of infrastructure that has cranes on the skyline, that’s generally inefficient. Like the Convention Centre – we subsidise it. We’re running a socialist economy! Pictured: Top – Ross Engineering workshop in Alice Springs. Recruiting staff, already a nightmare in Alice Springs, will become even more difficult when INPEX starts competing for skilled workers. That’s the view of Neil Ross, from Ross Engineering. On the other hand, the giant project – if it gets its final approval – may offer business opportunities for firms in The Centre, the huge distance from Darwin notwithstanding. He says it’s clear much INPEX work will go overseas but even “the crumbs” are a lot of money for Territory firms. Many Darwin companies are “putting themselves on hold” in expectation of work from the gas project. Alice Springs will be sandwiched between two giant projects, with Olympic Dam to the south. But Mr Ross says he’s taking a “glass half full” approach, keeping an eye on opportunities in Darwin as it may become a supply base for offshore rigs. 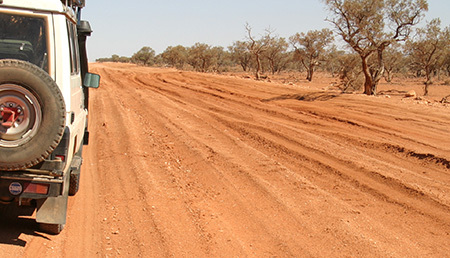 Above left– Upgrading regional roads would be the kind of infrastructure spending that conributes to economic development for “all terrtorians”, says Prof Gerritsen. Here, a section of the Plenty Highway, photo from our archive. Above right – The Alice Springs Aquatic Centre. Users pay to go there, while the Leanyer Water Park in Darwin is free – an example of the urban bias in the territory’s budget, says Prof Gerritsen. Barnes you just got burnt mate. I think the NT government is like the father with many sons and loves one son wanting to put all his faith into him alone. This is the case with IMPEX. We have an entire Territory to invest in for the future of the Territory. But the government stops cold any economic growth and holds out for IMPEX. Something in the dream planner and what is in the bounds of reality and profit to the Territory is put to sleep. Mr Barnes, the Territory is bigger than Darwin. And because of the Alice Springs News we have a voice to say that. The Territory is about all Territorians not just Labor government. Keep up the good work Erwin. I want all the Territory to grow and prosper. I am a proud Territorian but I am ashamed of the what the Labor government has done Australia wide and at the Federal level we are a laughing stock world wide. Well if the Alice News can find a negative it will. Chicken Little has nothing on the Alice News. Luckily it’s no longer distributed to the township and only a few who bother to log on will be depressed by the conspiracy theories you continue to peddle. Please keep this story and look back in five and 10 years and see how far off the mark you and Prof Gerritsen are. Perhaps it’s time to head back to Europe where you have plenty of negative stories to write and leave this great Territory to prosper. ED – You’re in good company logging on to the Alice Springs News Online. In the last 30 days we had 13,675 visits, 6338 unique visitors, 31,249 page views, 36% new visitors and an increase in traffic of 10% plus each month since going online exclusively. Next time you want to make assumptions about our readership feel free to get the facts from me first. And by the way, Central Australia, not Europe, is my home.